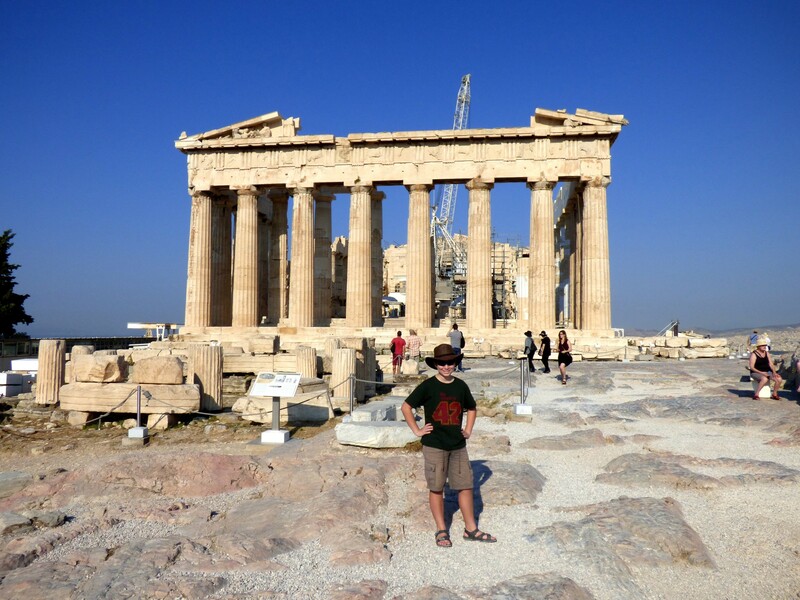 Dec in front of the Parthenon. Declan has been obsessed with Greek mythology for as long as we can remember – that’s really why we chose Greece as a destination. 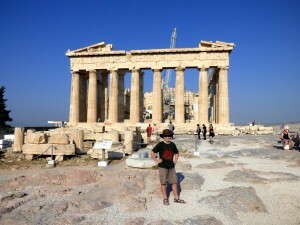 So visiting the Acropolis and Parthenon this morning was a big thing for him. As ruins go they are pretty, well, ruined; although there is a concerted effort underway to rebuild things as they were at some point in history. As a result the Parthenon looks better than it did 25 years ago, but, disappointingly, it’s all fenced off and you can’t wander through it. 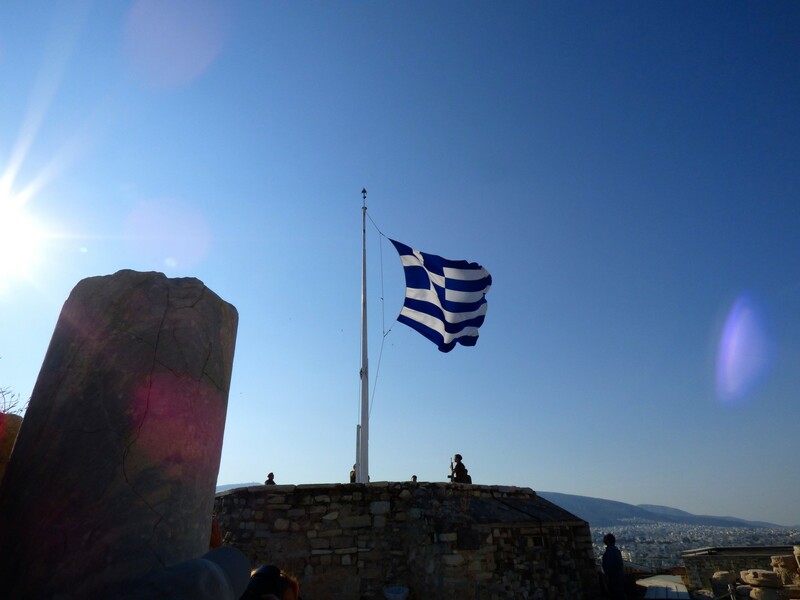 We climbed up the Acropolis first thing in the morning to avoid the crowds so we were early enough to see a contingent of the Greek army raising the flag that flies at one end of the massif. It was impossible not to see some analogy between the mess they made of raising the flag and Greece’s current political position. It was all very formal with lots of stamping and crashing of gun-buts, then they got the flag completely tangled up, and finally that stood and belted out the national anthem in a great example of enthusiasm trumping harmony. In the afternoon we visited the fabulous Acropolis Museum. This is a great modern building that houses the originals they have removed from the Acropolis as well as pointed reproductions of the Elgin Marbles. There were repeated references throughout the museum to the damage done by Lord Elgin in removing the marbles. I must say that the museum being so good, did push me further towards supporting the idea that the Marbles should be returned. After a swim and some sitting we wandered down the road and had dinner in a very nice outdoor restaurant while trying to pick the nationality of passing people (and failing a lot as almost all turned out to be Greek). Our meal was punctuated at a couple of points by our first real sign of the Greek financial crisis. We had seen small queues at ATMs, and the occasional poster; but nothing like what the press would have you believe. But this evening one couple rode past on a motorbike waving a ‘vote yes’ flag, and a police contingent roared through waving their hands wildly in the air. We assume the later had something to do with the two major rallies that are taking place at the moment in the City centre. 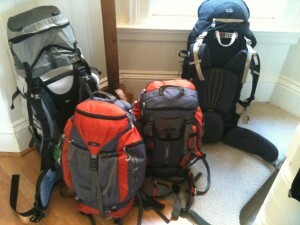 Around here, though, there’s hardly a sign of an issue.